Depression Awareness Month- What does it feel like? Here at PatientsLikeMe, there are thousands of people sharing their experiences with more than a dozen mental health conditions, including 15,000 patients who report major depressive disorder and 1,700 patients who report postpartum depression. What do they have to say? 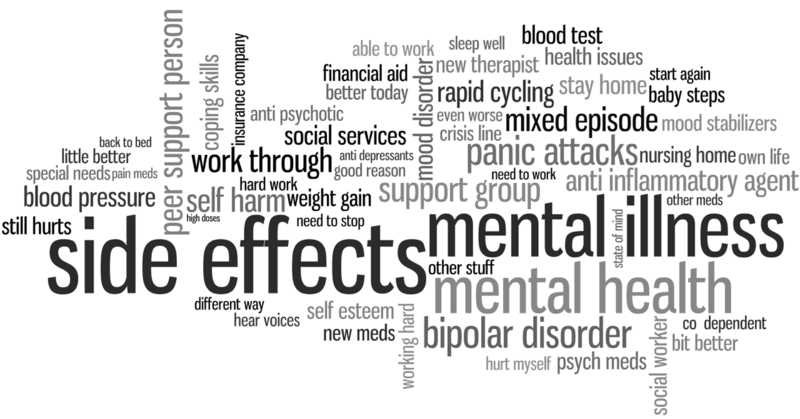 This word cloud has some of the most commonly used phrases on our mental health forum. Can you relate to any of these descriptions? If you’ve battled depression, we encourage you to join our growing mental health community and connect with patients just like you. Share this post on Twitter and help spread the word for depression. I am a new member. I am astonished at the number of websites such as this one on which I find nothing concerning new developments in connection with major depression. These are revolutionary. Ketamine has been approved by the FDA for use as as an anesthetic on humans and animals for many, many years. Some years ago it was found that it relieved treatment-resistant depression in hours. Trials have been conducted but to date it has not been approved for use with depression. However, because of the tremendous demand it has been administered in institutional settings and by a number of clinicians around the country. Much, much more could be said. See report on the work done by researchers Dr. Zarate, with NIMH, Dr. Charney, Dean, Ichan School of Medicine at Mt. Sinai Hospital, Dr. Krystal, Chair of Psychiatry at Yale School of Medicine. This report dated 3-13-14 is found on the website of Brain & Behavior Research Foundation (bbrfoundation.org). See the Ketamine Advocacy website and the report of Steven Levine, a board certified psychiatrist, on his website, heplive.com. There is also Transcranial Magnetic Stimulation (“TMS”). It has been approved for depressive treatment. It has no side effects. Requires only treatment in-office, by sitting in a chair with a head set containing the magnetic devices. No anesthetic. After about 40 minutes the patient is able to go to work or otherwise continue normal activities. The difficulties are cost and time consumption. The acute phase requires 5 treatments per week for 6 weeks and then they are tapered (tapering not always required). See report dated 9-17-14 on the Medscape website. Even newer and perhaps more promising is Low Field Magnetic Stimulation. Here again the effect is rapid mood elevation, a miniscule amount of magnetic stimulation with no side effects. See report dated 7-24-14 on website of Medical News Today. This has, of necessity, been very brief. Reports of these developments are found on numerous medical websites.